Although you can see one Mac’s iPhoto library on any other Mac in your home or office (as long as you’ve enabled photo sharing), you can’t edit or delete photos stored on another Mac, and you can’t even see the photos if the two computers aren’t on the same local network. So you may want to go beyond sharing, and start syncing your photos across Macs. Similar to iTunes, iPhoto stores not only your photos themselves but also other data-thumbnails and edited copies, as well as additional data about the photos (such as keywords and album contents)-that’s kept in database-like files. Therefore, synchronizing the individual files between computers might produce undesirable results-missing metadata, albums, and other information in either or both of your iPhoto libraries. But with a bit of preparation, you can keep iPhoto libraries on multiple computers in sync. Merge two iPhoto libraries If you already have different iPhoto libraries on two Macs, you’ll need to begin by merging the libraries from your two Macs; the best tool for this is Fat Cat Software’s $20 iPhoto Library Manager 3.4.1 (version 3.2.3, ). 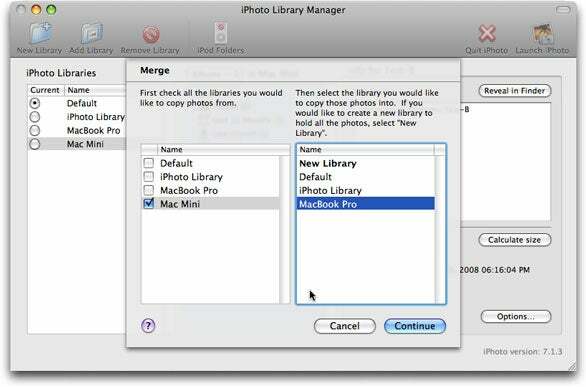 The documentation included with iPhoto Library Manager describes numerous options for merging libraries, but here’s one quick way to get both Macs’ libraries to have the same content, without duplicated photos and albums. First, on Mac A, make sure that Mac B’s disk is mounted in the Finder, and then open iPhoto Library Manager. Choose the Photo Copying tab in the program’s preferences. In this tab’s When Copying Photos section, make sure that both the Don’t Import Duplicates and the When Recreating Albums, Add Existing Photo In Place Of Duplicate options are selected. In the When Merging area, deselect the Create An Album For Each Library Merged option and select both the Recreate Contents Of Smart Albums In Merged Library and the Combine Contents Of Albums With Same Name options. Among iPhoto Library Manager's many talents is its ability to merge multiple iPhoto libraries. Next, if Mac B’s iPhoto library doesn’t already appear in the iPhoto Libraries list, click on Add Library, navigate to Mac B’s mounted volume and then to its your user folder/Pictures/iPhoto Library file, and click on Add. Choose File: Merge Libraries. Select Mac A’s library in your libraries in the list on the left; in the list on the right, select Mac B’s library. Click on Continue, and wait while the software copies Mac A’s photos onto Mac B. Finally, repeat the procedure, reversing the copy direction-this will ensure that both Macs contain a complete copy of each other’s photos. Thereafter, you can keep your two Macs’ iPhoto libraries in sync by repeating all the above steps to merge your libraries whenever one or both change. Alternatively, if you can be certain that changes have occurred in only one library, you can use a synchronization utility to copy all its files to the other Mac, overwriting the files in the same locations.